We eat, sleep, and breathe HR. And then we write about it. Many human resources professionals and managers dread open enrollment season and view it as an administrative nightmare. Employees are usually confused and don’t want to take the time to make their selections. As a result, some make poor choices or skip the enrollment process altogether and then must deal with the consequences over the next year. It doesn’t have to be this way. Open enrollment can actually be a great opportunity to engage with employees to help them make the right choices to safeguard their health and financial well-being. Everyone needs to know what the process will look like before it begins. Create a timeline of events and communicate it to employees as far in advance as possible. Use various methods to distribute the information. Some employees are more likely to read a paper flyer than an email. Also send frequent reminders of key dates throughout the process. Most employees do not adequately understand insurance benefits especially when it comes to the tradeoff between high premiums and low deductibles, the difference between traditional PPOs (preferred provider organization) and HDHPs (high deductible health plan) or how a H.S.A. (health savings account) works. Offering educational sessions in which benefits are thoroughly explained and questions are answered reduce the likelihood that employees will have to deal with the aftermath of poor choices. Encourage attendance by offering lunch and learn sessions. Even though employees may understand the basic concept of how insurance works, there can be much confusion surrounding carrier-provided plan summaries and insurance-related terms. This lack of understanding can be a barrier to employees fully understanding benefits. Creating and distributing a brief summary of coverage and definitions of key terms is tremendously helpful. 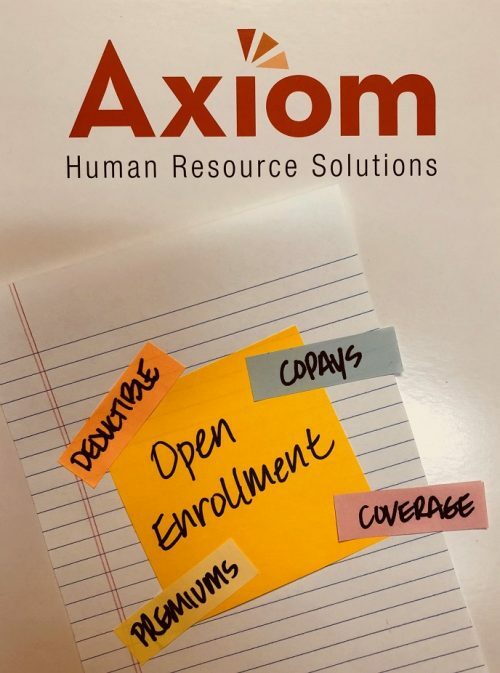 Download Axiom’s Health Benefit Terms Glossary to cut down on the misunderstandings. Set aside time to be available to employees to answer questions and assist in the enrollment process. Employees need to know there is an open door to assist them. This is especially important if you use an electronic means of enrollment as some employees have trouble with technology. Once open enrollment is complete, take a look back at the process and note how it can be improved for the next year. Also listen to the employees. Ask for feedback and find out what was helpful to them and what was not. Eliminating inefficiencies and making improvements in the process will make future open enrollments easier for everyone. Click HERE to view the July 2018 newsletter! Click HERE to view the June 2018 newsletter!